The hotel is a real village: several homes along a wide footpath, which used to be a road. You stay in one of those. The staff is super helpful and friendly. There is a bar with a good selection of drinks, and a restaurant that serves very good buffet dinners. 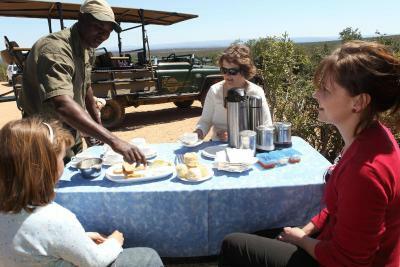 Very friendly staff, good food, wonderful Clifford who took us on the Safari at Addo. A lovely guide who made our trip. Mountain setting was nice and quiet. A beautiful part of the country. The food was excellent!! Fantastic & friendly staff. Great food. Comfortable beds. Spacious chalets. Beautiful location. Lovely gardens. I liked the historic aspects of the lodge. Lovely wide outside patio and pool area. Excellent units, breakfast and supper very nice. Staff very helpful and friendly.We arrived at 4pm after a 10 hour drive.Family was hungry and I asked Barbara if the kitchen could make us something to eat.Kitchen was closed but preparing for supper and they were able to give us a meat and cheese board.It was wonderful.No hesitation in making the platter.Thank you to the staff and Barbara. The room was beautiful and clean and we were welcomed with champagne on ice which was lovely. Mountain-top resort surrounded by savannah, Zuurberg provides panoramic views of Addo Elephant National Park. It features an outdoor pool and an array of outdoor activities from horse riding to hiking. Rooms at the Zuurberg Mountain Village combine safari-style with classic décor, offering natural furnishings. All rooms include a private patio and a panoramic deck and some have a deluxe bathroom. Guests can enjoy a selection of traditional specialties and some international classics at the restaurant of the hotel. Set within landscaped gardens, Zuurberg Mountain Village hotel also features a children’s playground and a tennis court. Port Elizabeth and the Indian Ocean can be reached in one-hour drive. Free private parking is available on site. Obiekt Zuurberg Mountain Village obsługuje Gości Booking.com od 24 SIE 2010. Kiedy chcesz się zatrzymać w obiekcie Zuurberg Mountain Village? Bezpłatnie! Przewodowe połączenie z Internetem jest dostępne w centrum biznesowym i jest bezpłatne. Zasady pobytu Obiekt Zuurberg Mountain Village przyjmuje życzenia specjalne – możesz je dodać w kolejnym kroku rezerwacji! Bezpłatnie! Maksymalnie dwoje dzieci od lat 0 do 2 – pobyt bezpłatny, na łóżeczkach niemowlęcych. Maksymalnie dwoje dzieci od lat 2 do 18 – opłata w wysokości 295 ZAR za osobę, za dobę, na dodatkowych łóżkach. Karta bankowa Obiekt Zuurberg Mountain Village akceptuje wymienione karty. Obiekt ma też prawo tymczasowo zablokować należną kwotę na karcie Gościa przed jego przyjazdem. Obiekt Zuurberg Mountain Village akceptuje wymienione karty. Obiekt ma też prawo tymczasowo zablokować należną kwotę na karcie Gościa przed jego przyjazdem.